I'm in one of two Queens high schools that still has a teacher cafeteria. It's under threat of closure, as not enough teachers are patronizing it lately. A food truck has parked by our school and has become pretty popular. Mayor Bloombucks has decreed if teacher cafes don't make enough money, too bad for the teachers. There's something incredibly callous about this. Teachers don't get a whole lot of luxurious perks, and this certainly isn't one of them. I love the kids I teach, but sometimes I want to be with adults. I can't imagine I'm the only teacher who feels that way. It's a pretty basic consideration. Here's the big secret--Mayor Mike doesn't think we deserve any consideration at all. That's why just about every city union got an 8% raise between 08-10 while he loudly told us to go fish. 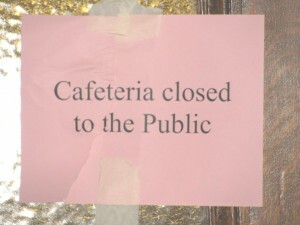 Some school buildings have been around over a hundred years, but it wasn't until Bloomberg took over that anyone decided teachers didn't warrant anything so basic as a place to talk or get a cup of coffee. This year, we're facing an evaluation system based on fairy dust, and no one's even seen it. Reformy John King, who taught one year in public school before launching his charter career, will decide which sort of junk science can best determine whether or not teachers are "effective." Meanwhile, with the advent of utterly untested Common Core, most of which no one's ever seen, let alone holding a curriculum, test scores are expected to plummet. Doubtless the tabloids will take that as further proof of teacher incompetence, and further evidence the only way children can learn is buy placing more tax dollars in the grubby little hands of hedge fund managers. Bloomberg works for a dollar a year. It's too much. That dollar buys the lowest teacher morale I've ever seen. How that benefits the million kids who go to city public schools, I have no idea.